I'm starting to learn how to like IPAs. Okay, well, I've been learning to like IPAs since last summer, and, although I am constantly making marked progress (I can honestly say that I thoroughly enjoy some of them), I still have a long way to go. Consider this: I have no post about a singular beer tagged "IPA" on my blog. Why is that? For my final winter post of the season, I'm branching far out from the traditional winter warmer. Now, with Blizzard of Hops, I'm writing my very first post devoted solely to an IPA. Here's hoping my limited enjoyment of the style extends to Tröegs' winter brew! Tröegs has a pretty exhaustive account of their history on their website, so be sure to check it out. But I'll go ahead and give you some of the highlights, so you know a little bit before you read about it in full. The brewery was birthed after two brothers, John and Chris Trogner, discovered a love of beer. After each attended college apart from the other, they both branched out into the beer universe--John to a brewery in Boulder, CO and Chris to brewing school in Europe. In 1996 they both converged in their home state of Pennsylvania where they laid the foundation for Tröegs. Twenty years later, the brewery continues to grow and expand, crafting original brews. Speaking of original brews, the brew at hand is one of them. Blizzard of Hops, a winter seasonal. An IPA. For the winter months. Who would've thunk it? According to the official Blizzard of Hops webpage, the ale has hints of citrus and pine, was brewed with four different varieties of hops, and boasts an ABV of 6.4%. There are some slight citrus notes on the nose, but these are nothing to write home about. Pleasant, but not outstanding. What is outstanding, however, is the way the ale's aroma manages to capture the full coldness of winter. I'll say this in the best way I can, and I'm not entirely sure how I can formulate this thought well enough for you to understand: Blizzard of Hops smells cold. 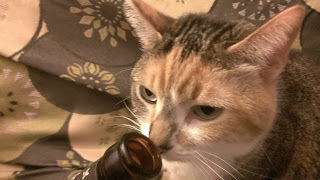 Purrl hates the cold, so I'm sure the fact that she only gave it three whiffs is more about that than it is about her true feelings of the beer. It is both piney and citrusy in the flavor department. More pine than citrus, which is welcome in a winter seasonal. I'm not yet at the point where I can identify an individual hop variety from its flavor, so I can't attribute the greater pine taste to a specific hop, but I'm glad its in there. I'm also getting a minor caramel taste, which mixes in perfectly with the rest of the ale. This is a chewy beer. Full-bodied, to boot. It's spot on for a beer designed to be enjoyed this time of year. Despite the brew's name, and its label art, it doesn't remind me of the depths of winter. It reminds me of a phenomenon that occurs sporadically through February and March in Ohio. During these wintery months, Ohio experiences odd warm spells that can last for days at a time. One day you'll find yourself wearing multiple layers, and the next you'll be in shorts and a t-shirt. During my final winter at Ohio University, we had a mid-winter warm spell. During those days, my fiancée and I took our cat, Háma, outside. We threw a leash on him and let him run around the front yard of our apartment building. He loved it--he spent so much time prowling through the grass and chasing what few insects he could find. We had a lot of fun playing with him during those days. Blizzard of Hops reminds me of them. 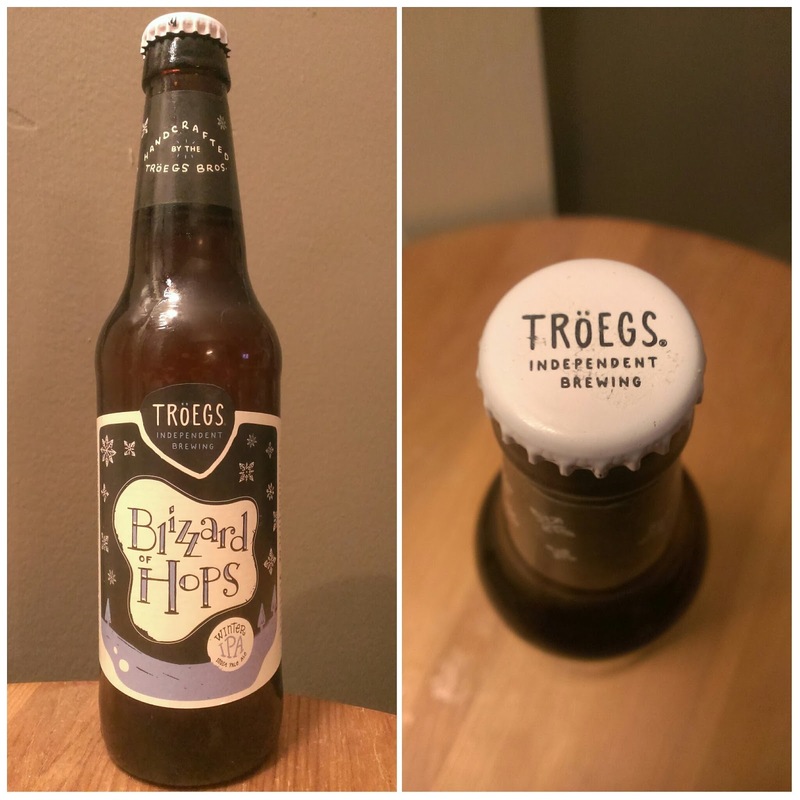 Take it from someone still learning to enjoy IPAs: Tröegs' Blizzard of Hops is great. It gets a solid John Likes Beer rating of 8.5/10. If IPAs are your thing, give it a shot!